= Nodularia douglasiae (Gray, 1833). — Do et al. (2018). = Nodularia douglasiae (Griffith & Pidgeon, 1833). — Bolotov et al. (2018). = Nodularia douglasiae. — Huang et al. (2018). = Nodularia douglasiae (Griffith & Pidgeon, 1833). — Zieritz et al. (2018). 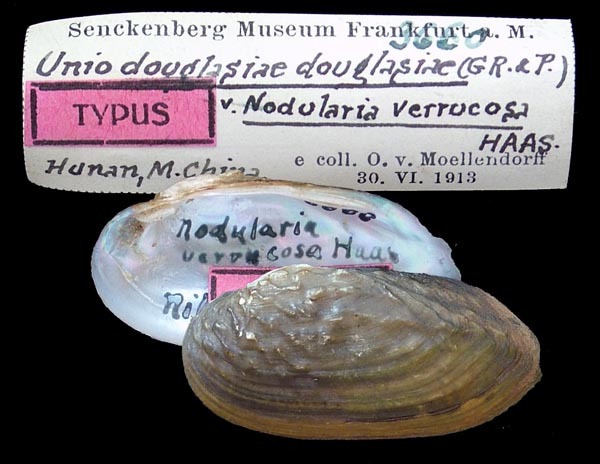 + Nodularia douglasiae crassidens Haas, 1910. — Do et al. (2018). = Nodularia douglasiae (Griffith & Pidgeon, 1833). — Pfeiffer et al. (2018). = Nodularia douglasiae (Griffith & Pidgeon, 1833). — Bolotov et al. (2017). 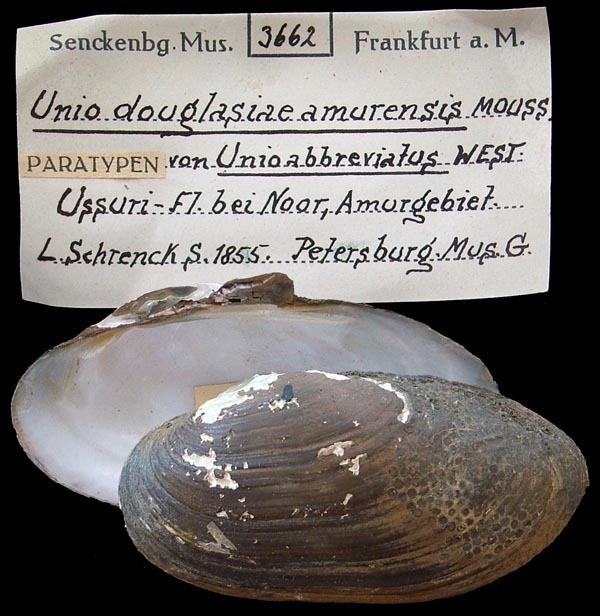 = Unio douglasiae. — Zhou et al. (2017). = Nodularia douglasiae Gray in Griffith & Pidgeon, 1833. — Sano et al. (2017). + Nodularia douglasiae nipponensis. — Sano et al. (2017). 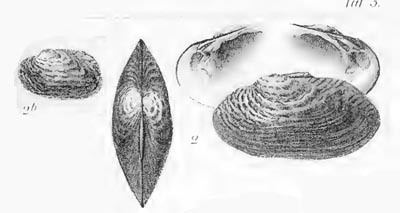 Unio douglasiae Griffith & Pidgeon, 1833. Gray in Griffith & Pidgeon, 1833, [in] Cuvier, Animal Kingdom: pl. 21, fig. 2 [as ‘douglasiæ’]. 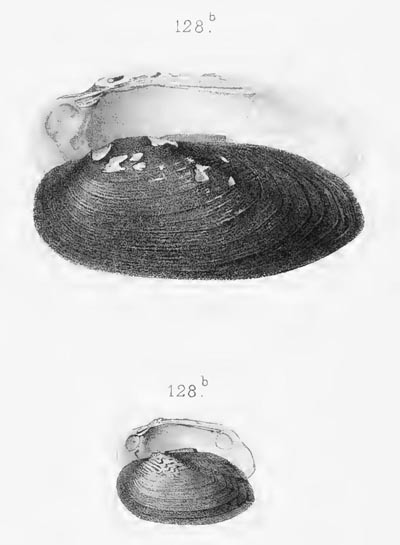 Gray in Griffith & Pidgeon, 1834, [in] Cuvier, Animal Kingdom: 601 [as ‘douglasiæ’]. 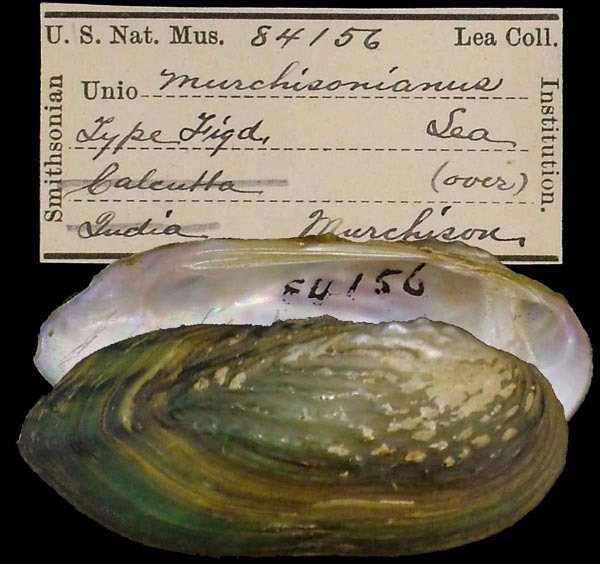 Margarita (Unio) merchisonianus Lea, 1836. Lea, 1836, Synopsis Fam. Naiades: 14 [corrected in the errata]. Philippi, 1844, Z. Malak. : 164. Philippi, 1847, Abbild. Beschr. Conch. : 45, pl. 3, fig. 1. Unio pictorum var. 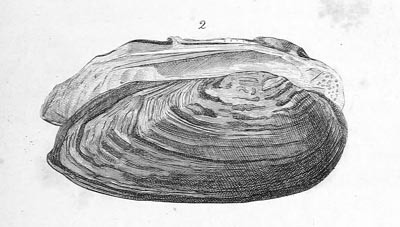 longirostris Middendorff, 1851. Middendorff, 1851, Reise Nord. Ost. Sibiriens: 276-277, pl. 28, figs. 1-3. Schrenck, 1867, Reise Forsch. Amurlande: 696. Lea, 1860, Jour. Acad. Nat. Sci. : 242, pl. 36, fig. 121. 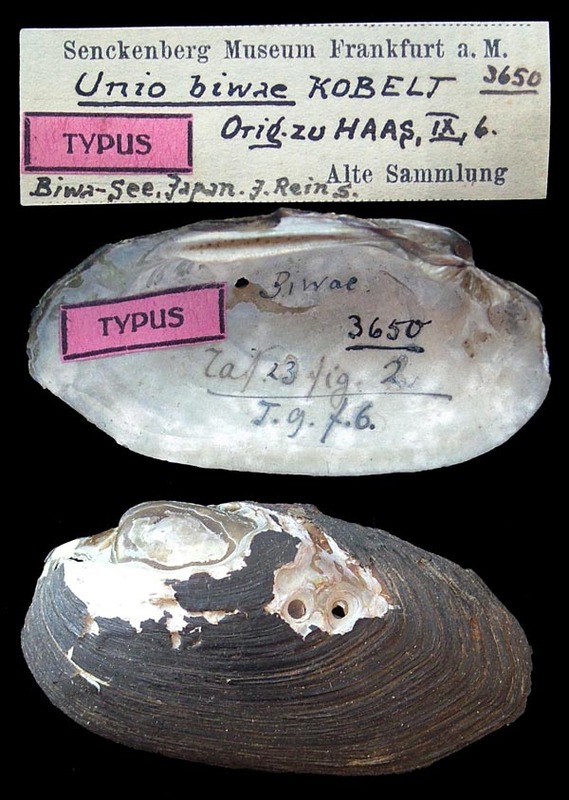 Type(s): HOLOTYPE BMNH_1965171, Shanghai, China. ‘Lea’ Küster, 1862, Conchyl. Cab. : 309. Lea, 1865, Proc. Acad. Nat. Sci. : 75. Lea, 1868, Jour. Acad. Nat. Sci. : 283, pl. 39, fig. 97. Schrenck, 1867, Reise Forsch. Amurlande: 696-699. Deshayes, 1873, Bull. (Nouv. Arch.) Mus. Hist. Nat. : 9, pl. 1, figs. 3-3a. 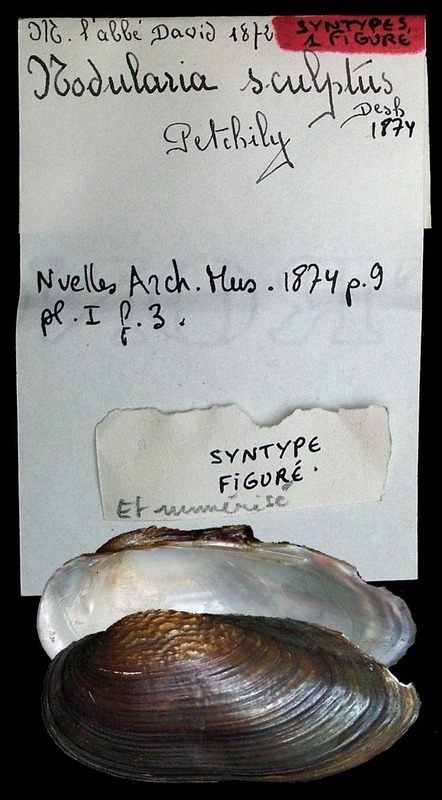 Type(s): SYNTYPES MNHN_MP_0108, Petchily, Chine Centrale. Martens, 1877, S.-Ber. Ges. Naturf. Freunde zu Berlin: 119. Martens, 1905, Zool. Jb., Jena, Suppl. : 58. Type(s): SYNTYPES ZMB_28142, Mukosima, Tokio, Japan. Unio pictorum var. 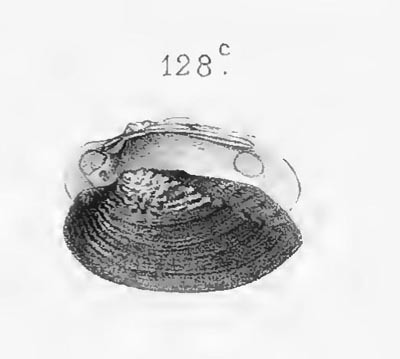 longirostris Westerlund, 1877. Westerlund, 1877, Kongl. Svenska Vet. Akad. Handl. : 74. Kobelt, 1879, Abh. Senckenb. Naturf. Ges. : 425, pl. 23, figs. 2-4. Type(s): LECTOTYPE SMF_3650, Biwa-See, Japan. 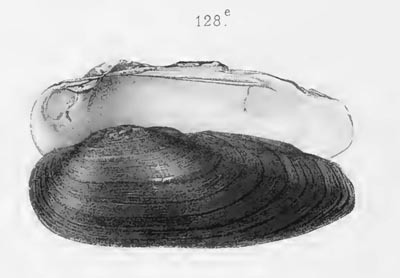 Kobelt, 1879, Abh. Senckenb. Naturf. Ges. : 422, pl. 12, fig. 3. 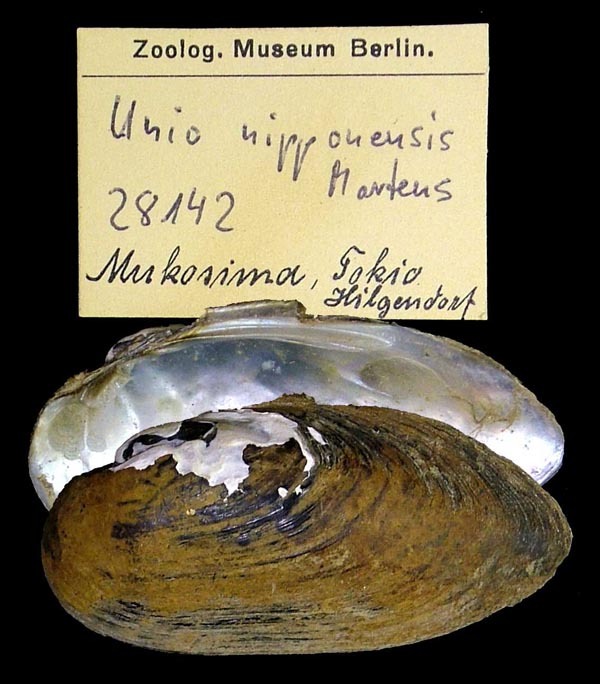 Unio douglasiae chloreus Heude, 1885. Heude, 1885, Conch. Fluv. Nanking: pl. 65 bis, fig. 128c. 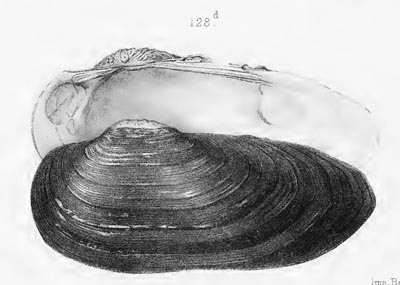 Unio douglasiae dactylinus Heude, 1885. Heude, 1885, Conch. Fluv. Nanking: pl. 65, fig. 128e. 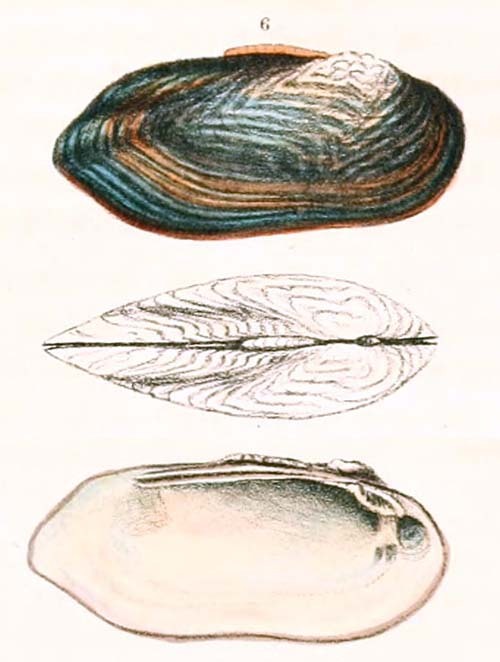 Unio douglasiae deltae Heude, 1885. Heude, 1885, Conch. Fluv. Nanking: pl. 65 bis, fig. 128d [as ‘deltæ’]. 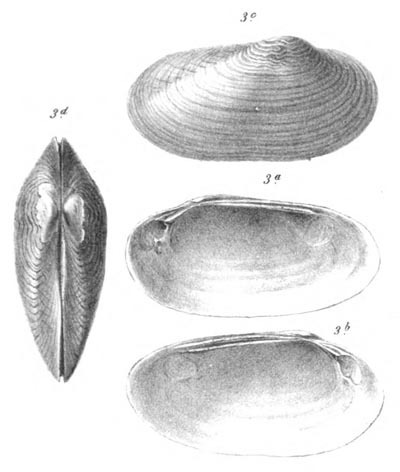 Unio douglasiae firmus Heude, 1885. Heude, 1885, Conch. Fluv. Nanking: pl. 65 bis, figs. 128b-b’. 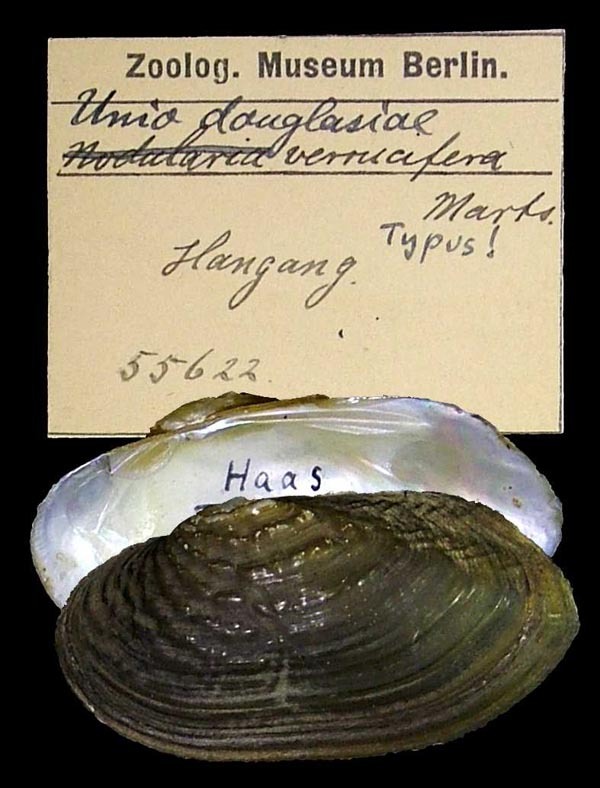 Unio douglasiae hainanensis Heude, 1885. Heude, 1885, Conch. Fluv. Nanking: pl. 65, fig. 128f. 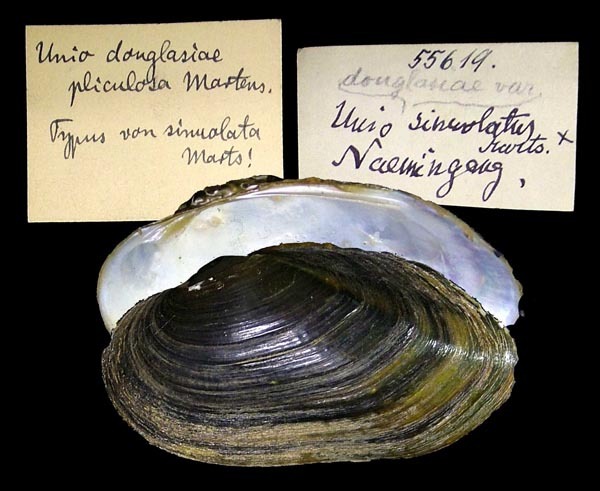 Unio douglasiae var. 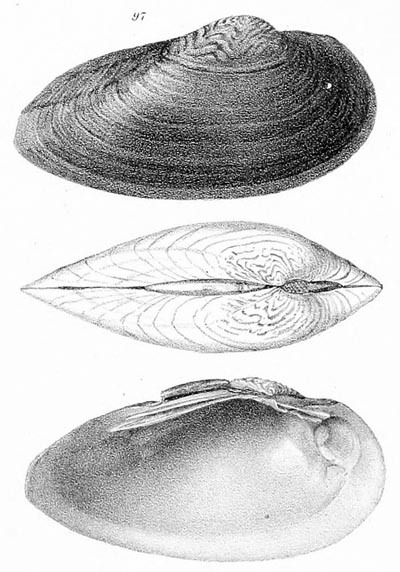 osbeckii Heude, 1885. Heude, 1885, Conch. Fluv. Nanking: pl. 65, fig. 128i. Unio pictorum var. 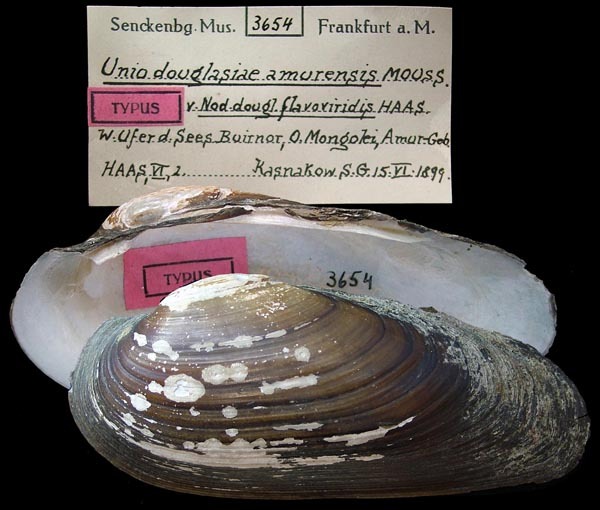 amurensis Mousson, 1887. Middendorff, 1851, Reise Nord. Ost. Sibiriens: 276-277, pl. 28, figs. 1-3 [as Unio pictorum var. longirostris]. Westerlund, 1890, Fauna Paläarct. Binnenconch. : 113. Martens, 1894, S.-Ber. Ges. Naturf. Freunde zu Berlin: 216. Martens, 1905, Zool. Jb., Jena, Suppl. : 60, pl. 3, figs. 3-3b. Type(s): TYPE ZMB_55620, Singei, Korea. Martens, 1905, Zool. Jb., Jena, Suppl. : 61, pl. 3, figs. 2-2b. Westerlund, 1897, Ann. Mus. St. Pétersbourg: 132. 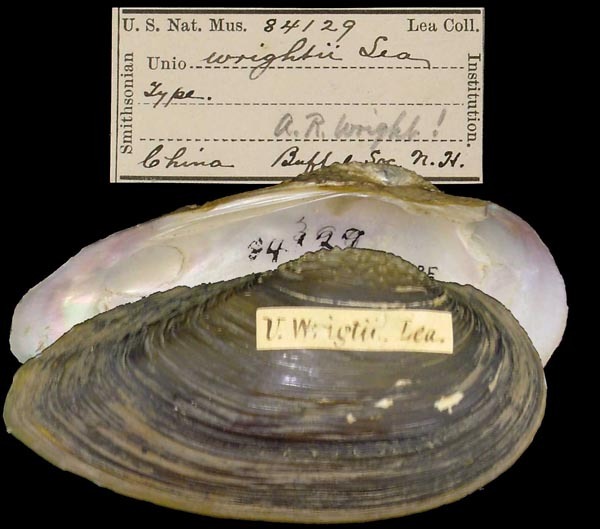 Type(s): PARATYPE SMF_3662, Ussuri fl. bei Noor, Amur gebiet. Westerlund, 1897, Ann. Mus. St. Pétersbourg: 131. 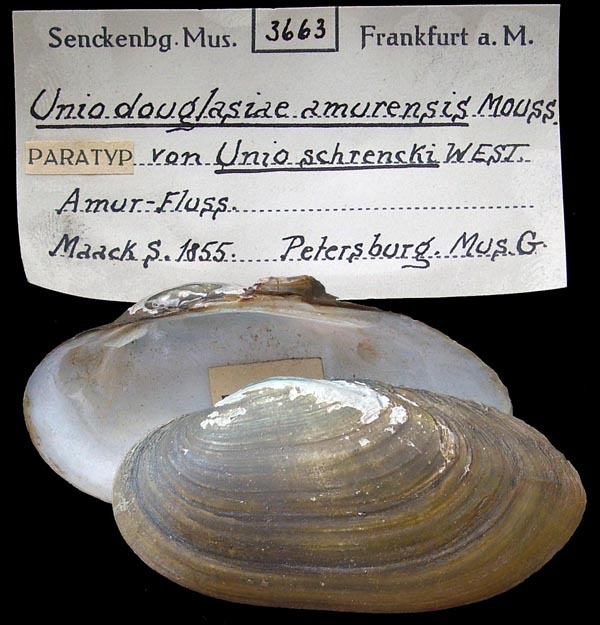 Type(s): PARATYPE SMF_3663, Amur - Fluss. ‘Lea’ Neumayr, 1899, Wiss. Erg. Reise Szechény Ost-Asien: 645. Neumayr, 1899, Wiss. Erg. Reise Szechény Ost-Asien: 645, pl. 2, fig. 3 [as ‘böttgeri’]. Neumayr, 1899, Wiss. Erg. Reise Szechény Ost-Asien: 645, pl. 3, fig. 1. 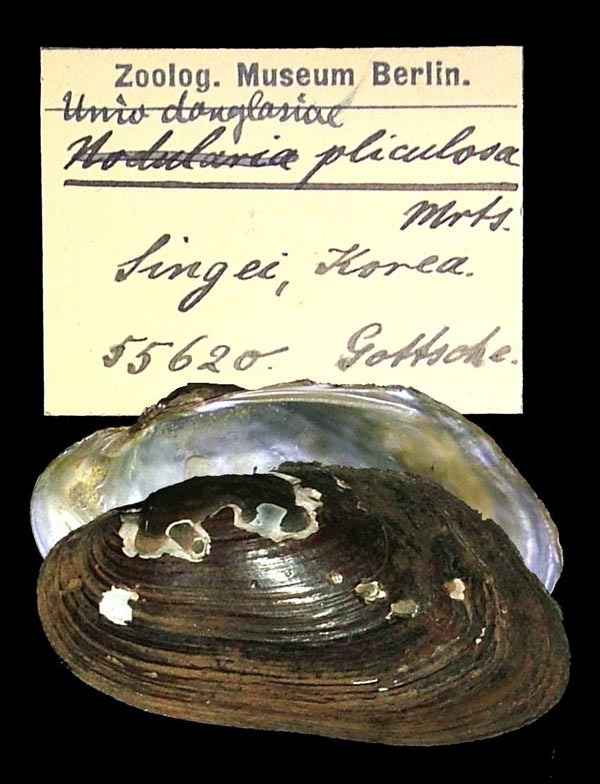 Nodularia douglasiae taiwanica Pilsbry & Hirase, 1905. Pilsbry & Hirase, 1905, Proc. Acad. Nat. Sci. : 750. 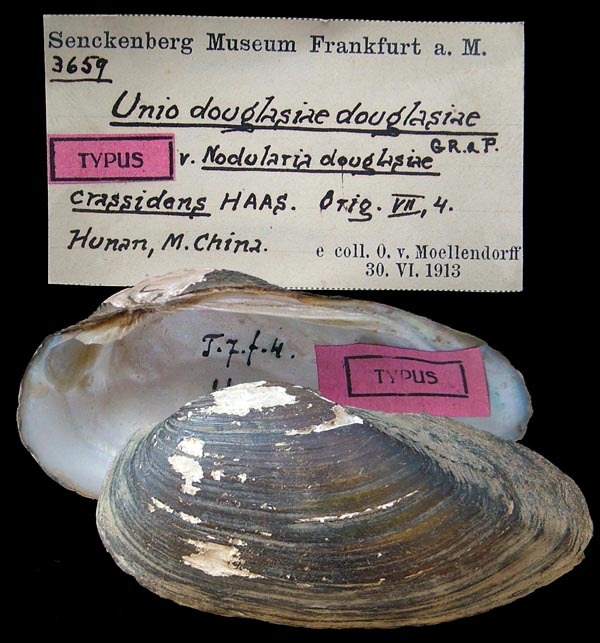 Unio douglasiae var. sinuolatus Martens, 1905. Martens, 1905, Zool. Jb., Jena, Suppl. : 57, text fig. 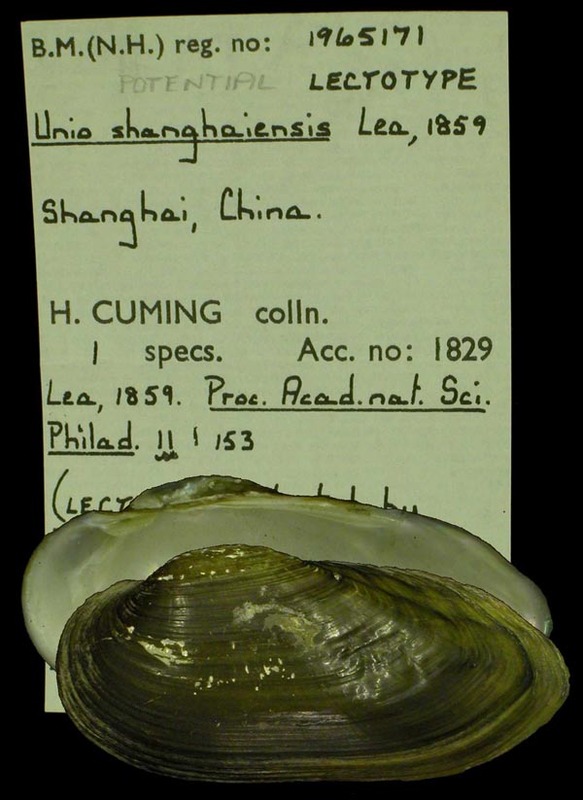 c.
Type(s): TYPE ZMB_55619, Hatanggyoen am Naemingang. Haas, 1910, Nachr. Bl. Dtsch. Malak. Ges. : 99. Type(s): TYPE SMF_3660, Hunan, M. China. 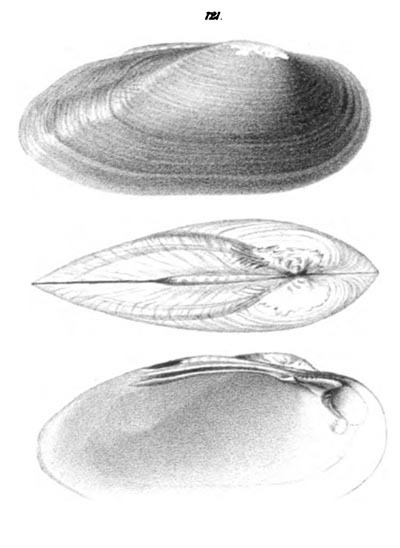 Nodularia douglasiae crassidens Haas, 1910. Haas, 1910, Ann. Mag. Nat. Hist. : 499. Haas, 1910, Conch. Cab. : pl. 7, figs. 4-5. Haas, 1911, Conch. Cab. : 75. Unio wrigtii de Gregorio, 1914. ‘Lea’ de Gregorio, 1914, Il Nat. Siciliano: 40. Unio (Nodularia) douglasiae var. schrenki Zhadin, 1938. 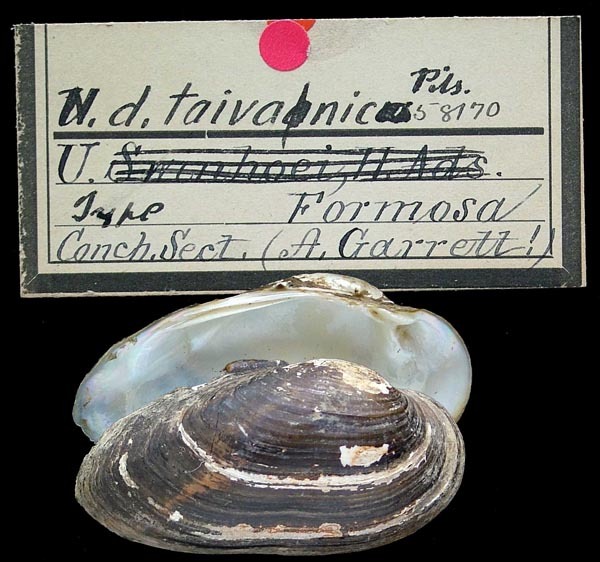 ‘Westerlund’ Zhadin, 1938, Faune USSR Mollusques: 99. Moskvicheva, 1973, Zool. Zhur. : 1463, figs. 1 с-т. Unio firnus Liu et al., 1979. Liu et al., 1979, Econ. Fauna China: 74. 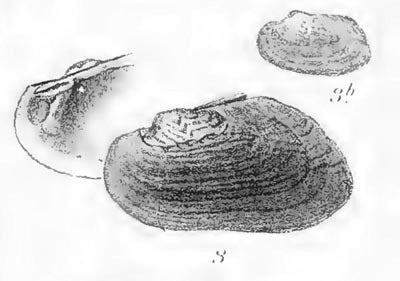 Unio douglasiae chlorens Liu et al., 1979. 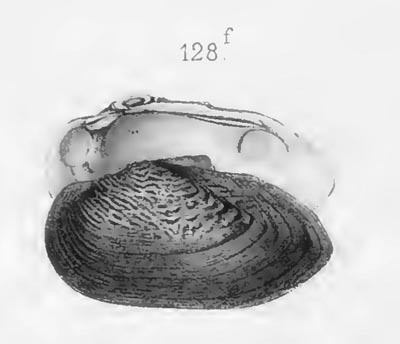 Unio douglasiae cleltae Liu et al., 1979. 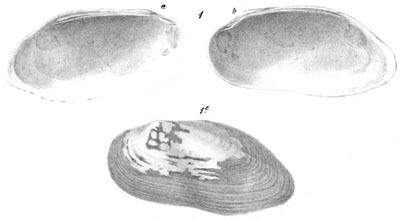 Nodularia doctylina Liu et al., 1980. Liu et al., 1980, Acta Zool. Sinica: 366. Nodularia lebedevi Zatravkin & Starobogatov, 1984. Zatravkin & Starobogatov, 1984, Zool. Zhur. : 1787, figs. 5-8. Nodularia (Magadaninaia) extremalis Martynov & Chernyshev, 1992. Nodularia (s.s.) moskvichevae Bogatov & Starobogatov, 1992. Unio douglassiae Kantor & Sysoev, 2005. Unio ezonis ‘Kuroda, MS’ in ANSP coll. .
‘Kuroda, MS’ in ANSP coll. Of Authors.